IP Man Wing Chun Ip Man Wing Chun is the most effective self defence martial art system made populate by Bruce Lee. Ip Man's two sons, Ip Chun & Ip Ching, at the age of 90 & 80 years, respectively, currently teaching in Hong Kong. Members of the Hong Kong Police Force are students of Ip Man Wing Chun Association. This is a living proof that Ip Man Wing Chun is good for your health and not just for self defence. We are loyal lifetime members of the Ip Man Wing Chun Association of Hong Kong. The most effective form of self defence martial art made popular by Bruce Lee. Can be practised / applied in small confined space. Most teens have frequently miscommunicate and therefore can get into troubles. Wing chun will provide an effective self defence should issues escalated into fights; otherwise, wing chun is a good sport fitness that stimulates your mind. No need to build up bulging muscles to effectively defend yourself. A great way to keep fit and to de-stress, from young into old age. Traditional Ip Man lineage Wing Chun. Originally invented for a weak to handle a stronger person. Chi sau (sticky hands) training. Complete Ip Man Wing Chun system including weapon interactions. Members of the Hong Kong Police Force are students of Ip Man Wing Chun Association. Private lesson and Instructor training available. 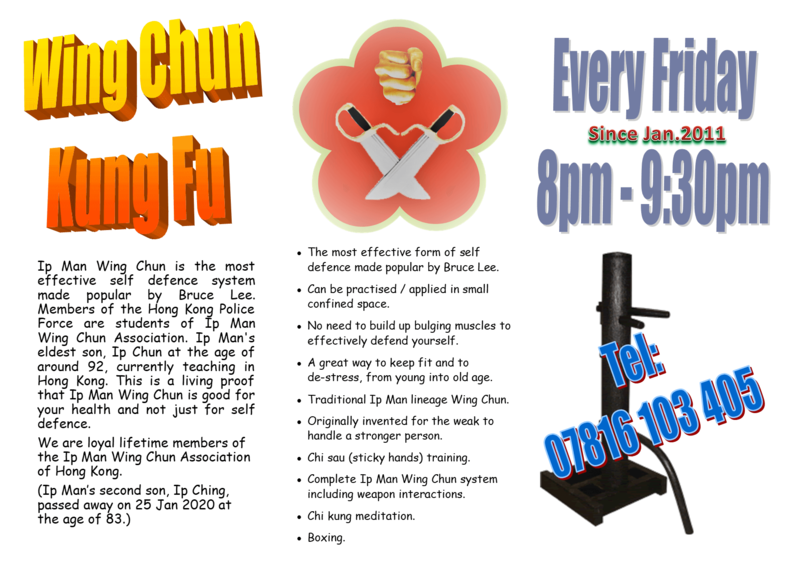 Locations: Ashford, Staines, Spelthorne, Slough, Feltham, Twickenham, Tedding, Hounslow, Richmond, Isleworth, Whitton.Ip Man Wing Chun is the most effective self defence system made populate by Bruce Lee. Ip Man's two sons, Ip Chun & Ip Ching, at the age of 90 & 80 years, respectively, currently teaching in Hong Kong. Members of the Hong Kong Police Force are students of Ip Man Wing Chun Association. This is a living proof that Ip Man Wing Chun is good for your health and not just for self defence. We are loyal lifetime members of the Ip Man Wing Chun Association of Hong Kong. The most effective form of self defence martial art made popular by Bruce Lee. Can be practised / applied in small confined space. Most teens have frequently miscommunicate and therefore can get into troubles. Wing chun will provide an effective self defence should issues escalated into fights; otherwise, wing chun is a good sport fitness that stimulates your mind. No need to build up bulging muscles to effectively defend yourself. A great way to keep fit and to de-stress, from young into old age. Traditional Ip Man lineage Wing Chun. Originally invented for a weak to handle a stronger person. Chi sau (sticky hands) training. Complete Ip Man Wing Chun system including weapon interactions. Members of the Hong Kong Police Force are students of Ip Man Wing Chun Association. Private lesson and Instructor training available. Locations: Ashford, Staines, Spelthorne, Slough, Feltham, Twickenham, Tedding, Hounslow, Richmond, Isleworth, Whitton.